The Aztec UFO Incident-the first ever widely publicized report of a recovered flying saucer-was derided as a hoax for decades. But now the Ramseys and Frank Thayer reveal the exact spot where the craft landed and show how the 100-foot diameter saucer was moved to a secret laboratory. Witnesses to the incident who were interviewed by the authors affirm that they were sworn to secrecy by the military. The authors also reveal the names of scientists who worked on the craft after its recovery. Also discussed are previously unseen documents from the CIA, FBI, U.S. Air Force, and U.S. Army that constituted a cover-up whose sole purpose was to surround the Aztec story with a smokescreen of lies, misinformation, and destructive allegations. Roswell is no longer the only proven flying saucer recovery we know about. 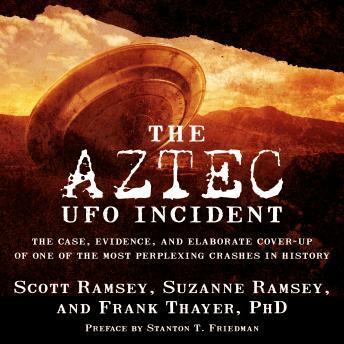 The Aztec UFO Incident is a must-listen for historians and UFO students alike.